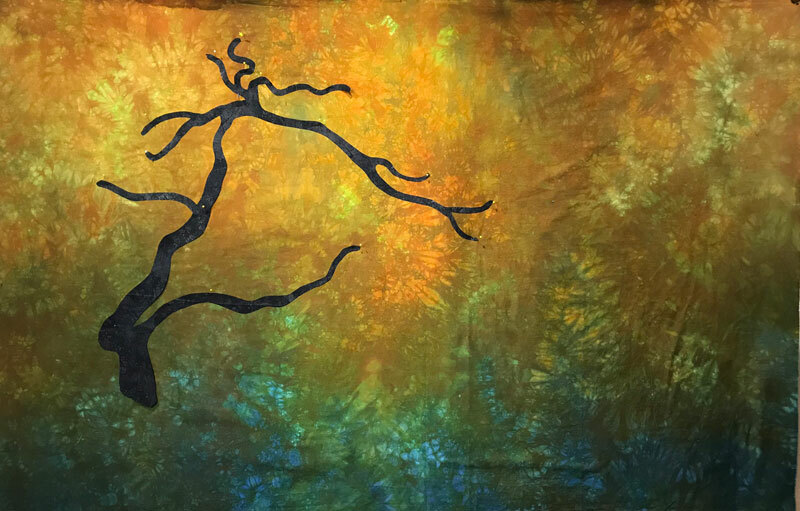 I bought this gorgeous hand dyed fabric over a a year ago from my good friend, Lisa Reber. I finally found time to dig it out of my stash of precious hand dyed backgrounds. Her fabrics are so inspiring to me and this one did not disappoint. 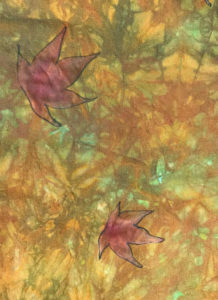 The rich gold and teal in this made me think of autumn trees and sky. Of course, you can see I eventually decided to flip it so the blue became the water. 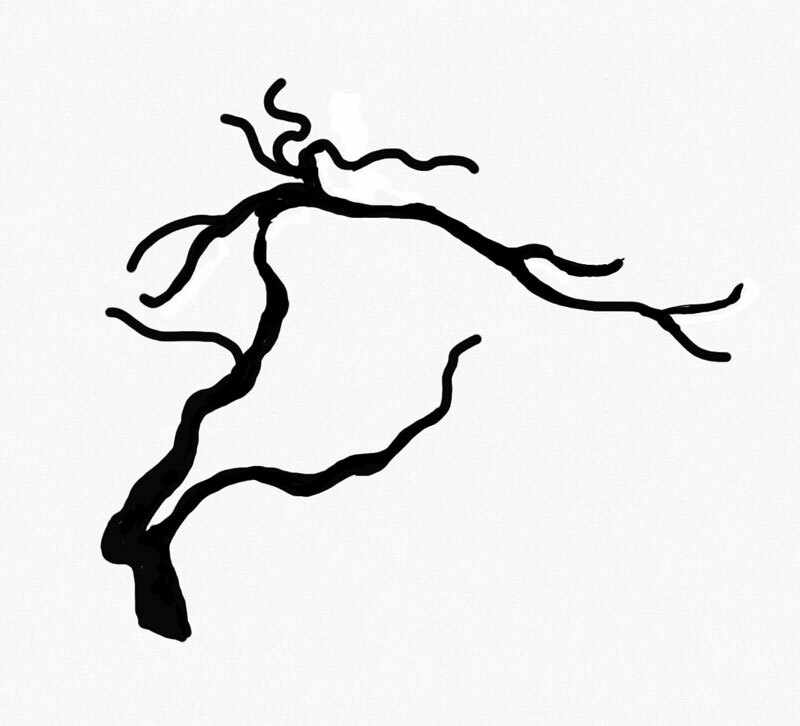 The first thing I did was trace a tree image on my iPad using the “Sketches” app (thanks to Susie Monday’s “Art on the iPad class I took in Houston). I scanned the image into my Cricut software and cut it out of freezer paper to audition it for size. 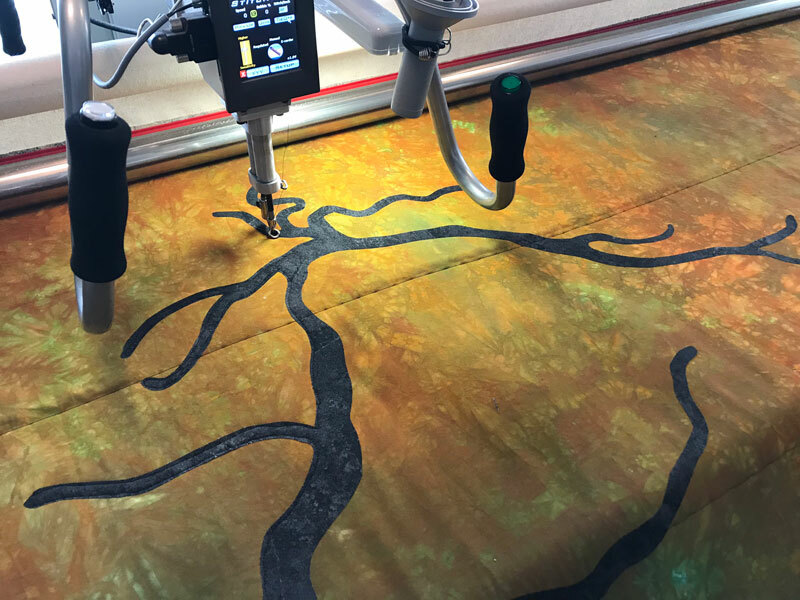 I then used the freezer paper to cut the tree out of black fabric (I used Northcott Stonehenge) which had MistyFuse applied onto the back of the fabric. At this point I went ahead and loaded the quilt onto the long arm machine. 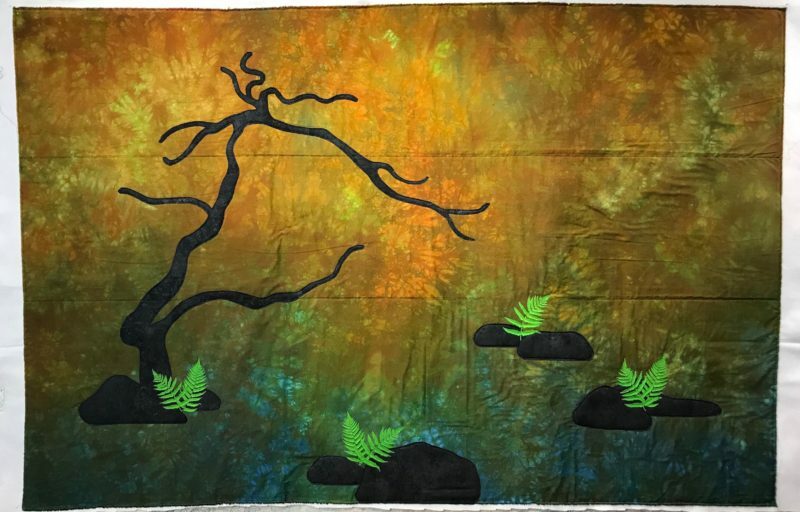 I fused and stitched down the tree. 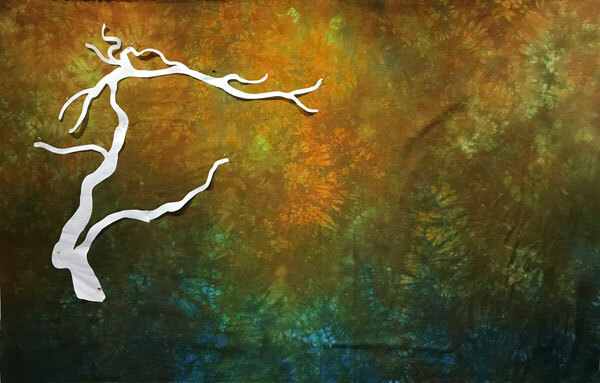 and I decided to add another branch on the right to balance out the design. The leaves are just pinned at this point. 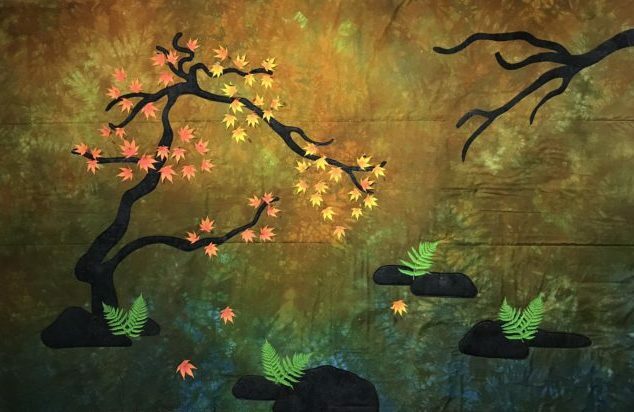 I cut out lots of maple leaves from the Evolon that I had painted with textile paint with fusing on the back. Then I proceeded to add more color to them with Inktense pencils and blocks. After taking the class on Inktense with Ana Buzzalino in Houston I realized that the ink moves around much better without that layer of paint underneath. 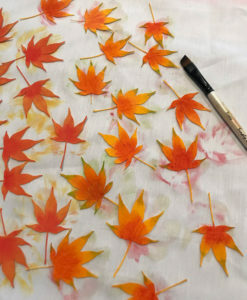 I traced some of the maple leaves right onto the background with ultra fine Sharpie and then added the Inktense pencils with fabric medium like we did in class. I loved how they turned out. 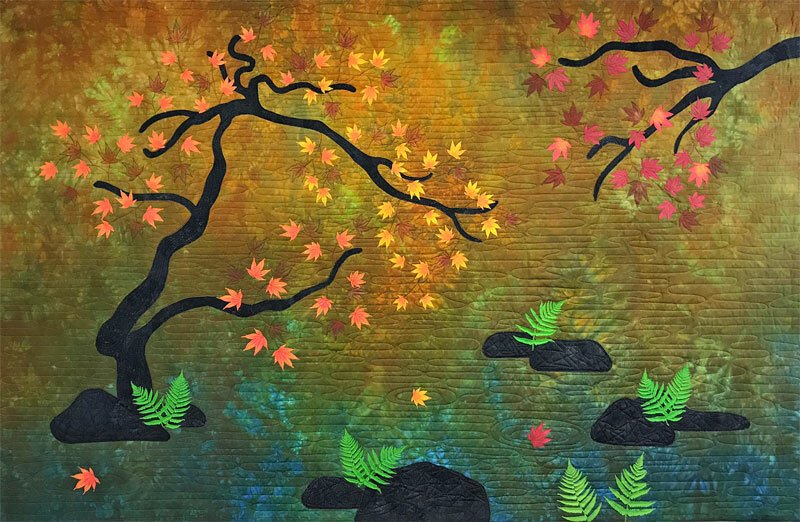 They were more subtle and gave the landscape a more layered feeling. 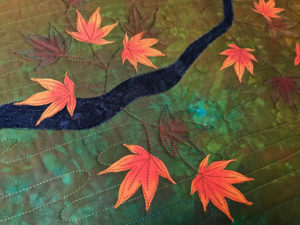 At this point I quilted the rings around the three maple leaves which had fallen onto the surface of the water. 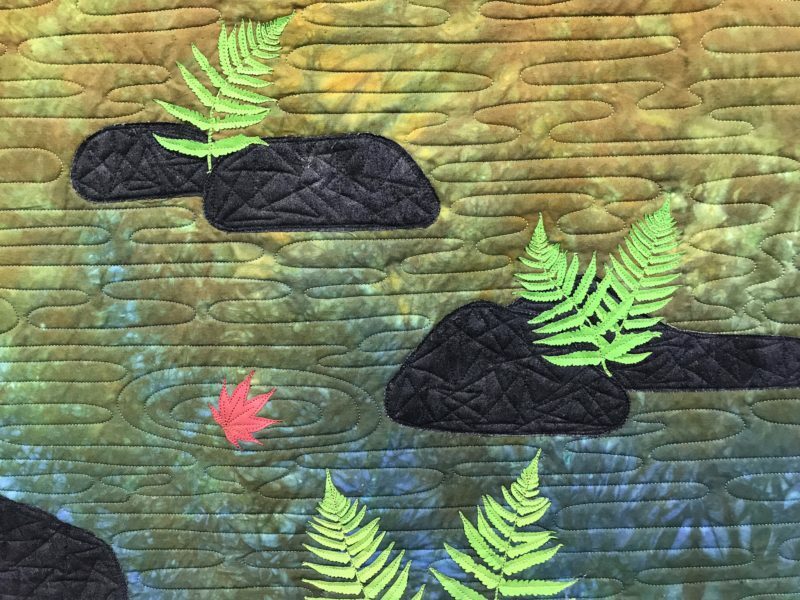 Then I quilted the whole background, the tree trunks, and the rocks. 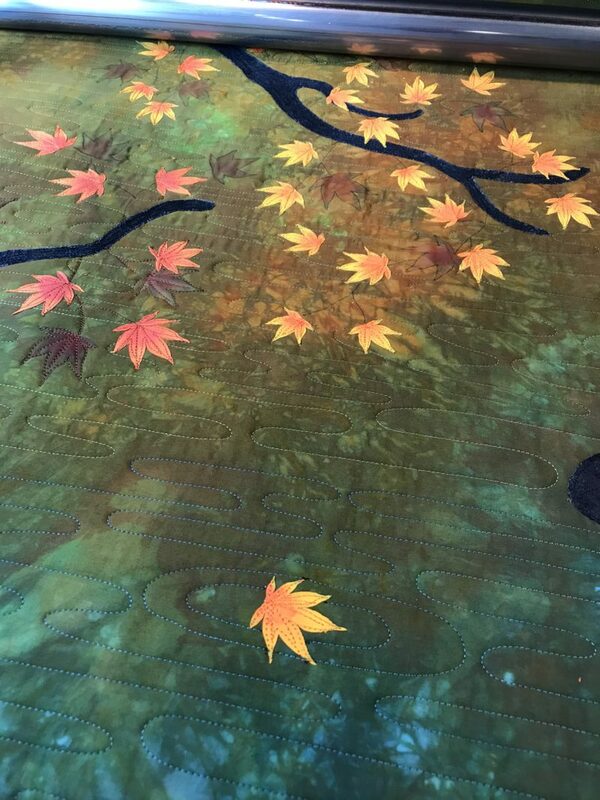 I laid out the Evolon leaves and I steam fused the leaves onto the surface while loaded on the long arm then stitched them all down. 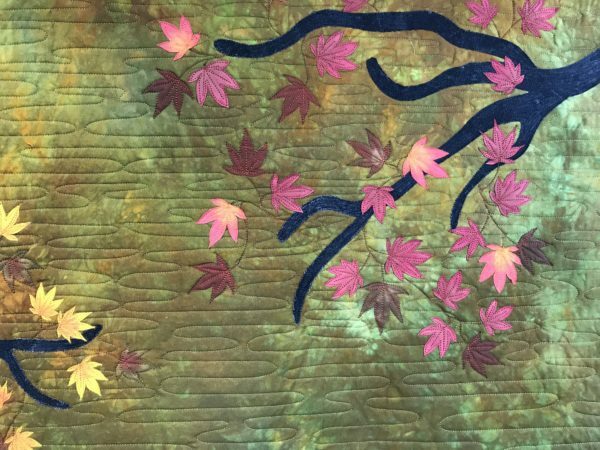 This was, by far, the most tedious process of the whole quilt. It seemed endless. If you look closely, you can see that the original leaves (as seen in the inktense ones that I traced) are much more pointed. It was impossible to stitch those points down on the long arm so I just trimmed them off of the paper ones. I also cut off all the stems and simply drew them on with a Sharpie. I’m so glad for the extra knowledge I gained in the classes I took in Houston and am eager to do a lot more experimenting. I always feel so empowered and excited when I learn how to do something new. Here she is, all done!